Home / google / google i/o 2012 / google+ events / google+ events invite / google+ events launched / google+ party mode / news / social media / Google+ Events launched- Before, During and After! Google+ Events launched- Before, During and After! Finally Google+ Events has seen the light of the day. Events was one of the most demanded features on Google+ and it has come at the right time. Google+ the social network from Google is growing at a great pace with almost 50% users signing in daily and most of them spending hours on Goolge+ Hangouts. If you haven't visited Google+ since yesterday than you will see a pop-up notifying you of a new feature when you sign in. 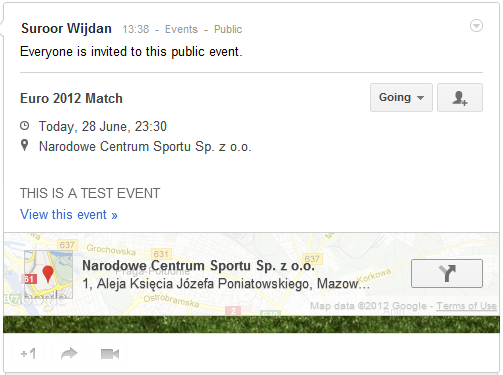 Google+ Events makes an event much more enjoyable without worrying about invitations and stuff. 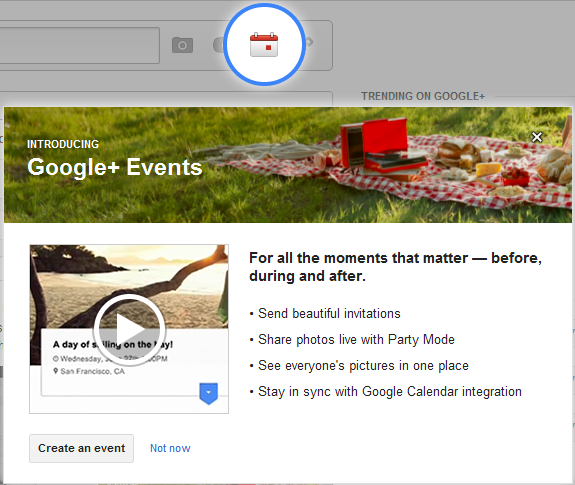 Google+ Events is for all the moments that matter before, during and after the event. Vic Gundotra, senior vice president is said to be the brain behind Google+ launched the Events feature at Google I/O 2012 keynote. 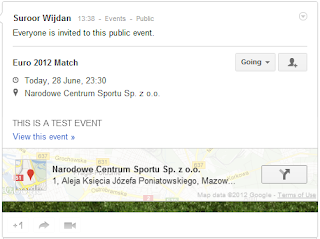 You can create beautiful event invites and send them to your friends on Google+ and even to those who are not on Google+. You can choose a perfect animated header image for your invites which suits the theme of your event. Once you take your mouse over the event invite, a flip card opens up and gives you three options, to check availability by looking into your Google calendar, to view the event details and to get directions to the venue of the event. There is a party mode which can be turned on by all the attendees and will enable them to share live pictures they take at the event at one place for everyone to see. This is really an awesome feature which will make partying more fun and you won't have to jump to see some pic in your friends phone as you will have all the pictures right on your smartphone at the event page. After the party is over, than you will want to see the pics that were taken during the event and Google+ Events has that covered too. You can see all your event pics at one place arranged in the chronological order ,the people who are tagged in them and the people who have contributed by taking the pics. Google has made an enormous progress since they started Google+ and today is the first birthday of the social network. So what are you waiting for, get on Google+ and plan an event and invite your friends and tell us your experience.